Cedar leaf holiday fragrance oil is a customized blend of scents that invokes the smells of winter holidays. Cedar leaf is a woodsy scent, and it is combined with other fragrances to create a unique perfume. 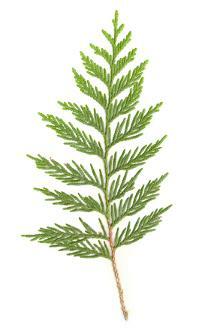 Cedar leaf essential oil comes from the leaves of the Northern White cedar tree. The oil itself is clear to very pale yellow in color, so it shouldn't have any effect on candle coloration. This oil has historically been used to treat colds, sinus conditions, and allergies. It is also commonly used as a natural insect repellent, though it should never be applied directly to the skin in an undiluted state. Cedar leaf oil should not be confused with cedar wood oil. The two are very different in both scent and consistency, but they can be mixed together in a fragrance blend with nice results. Cedar leaf essential oil has become popular for use in candles and bath products because of its warm scent and staying power. Several years ago, a fragrance blend based on this essential oil, called Cedar Leaf Holiday Fragrance Oil, was available for purchase for candle makers and other crafters. These days this specific oil is no longer available through most candle or craft supply outlets, though you may be lucky enough to find a bottle on auction sites like eBay. Fortunately, it's easy to create your own fragrance blends to mimic or even improve upon the original. Creating a blend of essential oils may sound intimidating, but with a little trial and error you'll soon find that it's a simple procedure that can result in some fantastic customized scents. All of these scents invoke memories of holiday baking, Christmas trees, comforting seasonal food, and family gatherings. You can add any other scents you like to make a truly personal blend.Since you're using an essential oil rather than a synthetic fragrance oil as your base note, choosing other essential oils to blend with it will result in a more stable final product. You can certainly try blending fragrance and essential oils together, however. Use the steps outlined in how to make fragrance oil to create your custom scent. Essential oils are widely used for candle making and other crafts, but they can be toxic and must be handled safely. Some can cause skin irritations and burns, while others are highly dangerous if ingested. Always read labels and do some research on each scent before using essential oils, and make sure you don't add too much of these fragrances to your candles and other projects. Store your finished scent blend in an airtight container, preferably an amber glass bottle. The amber color will keep it free from light damage. Keep the bottle away from direct sunlight and stored in a cool, dry place. Once you've created the perfect cedar leaf holiday blend, you can use it to make scented holiday candles. You could also create matching scented potpourri, soap, and other bath and body products. A set of homemade scented products makes a thoughtful gift too!